I absolutely love body butter, but my all-time favorite brand isn’t cheap. In hopes of saving money this year, I’ve started using my own DIY body butter recipe.This is an easy DIY craft that you’ll love! Making your own body butter is not only easy but free of harsh chemicals and extremely cost effective. Incorporating this recipe into your daily beauty routine will leave your skin silky smooth and smelling amazing. The lemon aroma with a hint of vanilla lasts all day long! The best part of all is that you can whip this recipe up in under 30-minutes from start to finish. 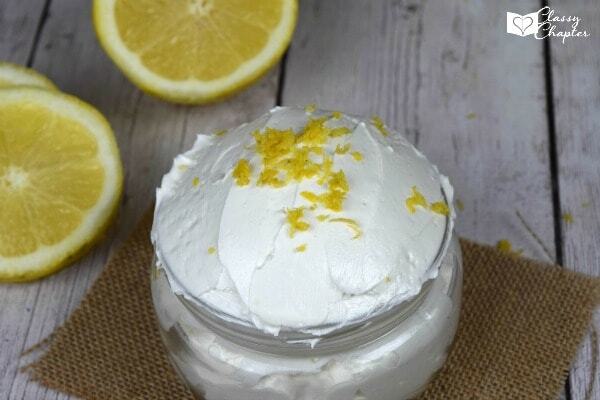 Give this DIY Body Butter a try! 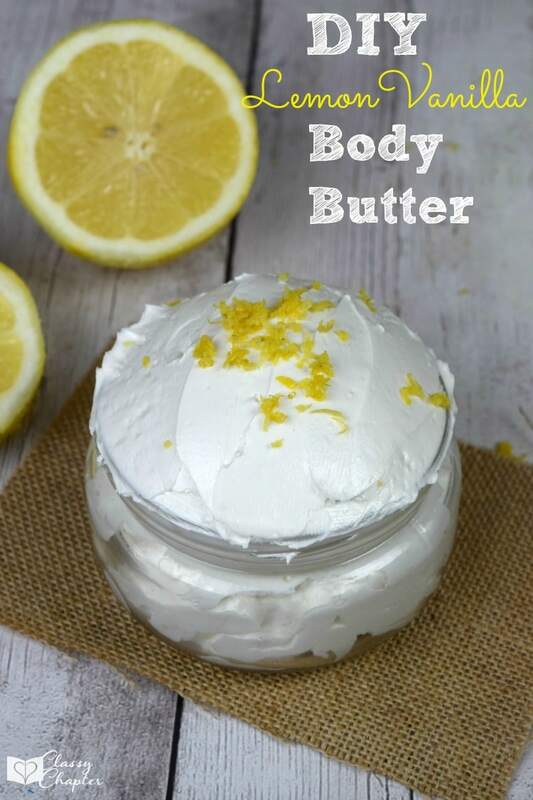 If you enjoyed this homemade body butter recipe make sure to check out my other DIY beauty posts. Make sure to follow me on Pinterest for more fun and easy DIY projects! I love making my own skincare. Thanks so much for sharing this, Kristi! You are welcome!! You’ll love this. What a great gift idea! I’m having girls night in with some friends and I may actually try to make a couple of batches for them to take home. Oh they would love it! It’s seriously so easy to make. I just happen to have all the ingredients at home so this is a must try! Looks luscious, good enough to eat! My daughter recently made a body scrub with similar ingredients. Clare recently posted…Things to help you sleep – 5 “Good Night” tips for busy moms! Thank you!! I can’t wait to see your list of handmade gifts. Congratulations! You were featured on my Friday Flash Blog on The Jenny Evolution. Feel free to grab some swag for your post showing you were featured! That looks wonderful! 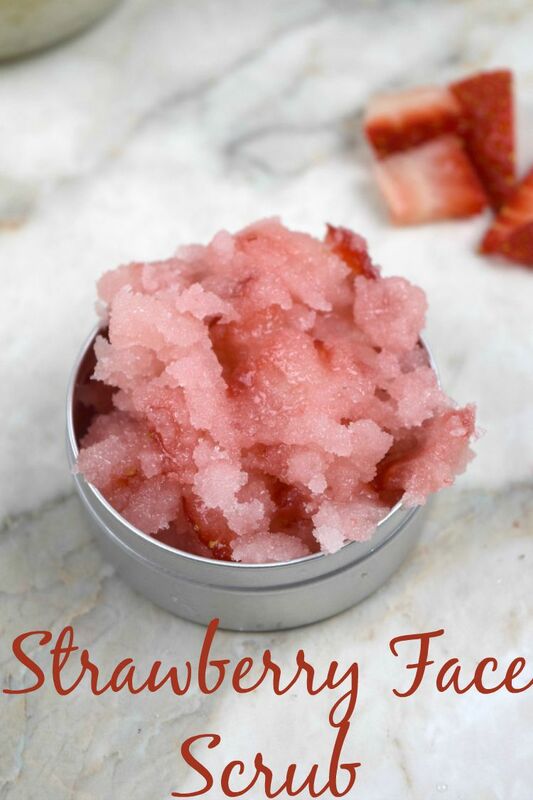 I’ve done some sugar scrubs but this looks great too! Adding it to my to do list! Popping over from The Jenny Evolution. How wonderful, it looks so creamy and it must smell lovely. Thanks for linking up to Sweet and Savoury Sunday, stop by and link up again. Have a great day!! Thank you so much! I’ll be sure to stop by and link up some new content! I just came across your recipe, and it sounds lovely. 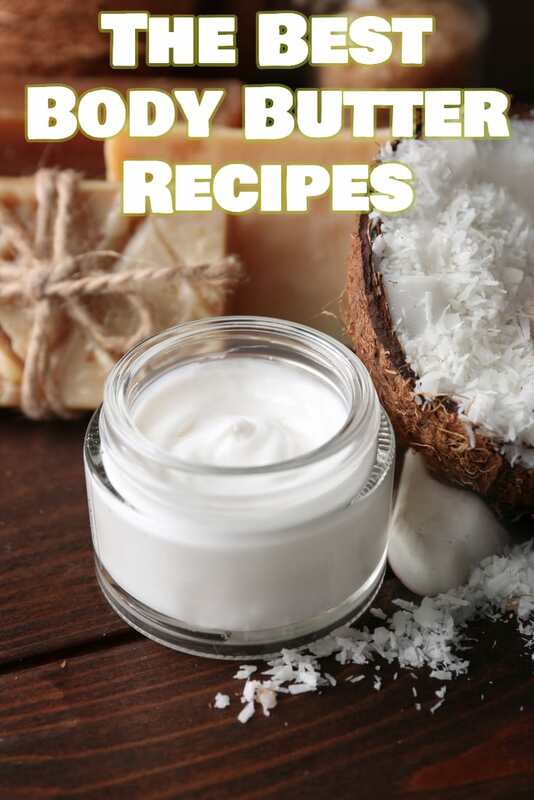 Most of the Body Butter recipes out there are made with more Shea or Cocoa Butter, than Coconut Oil. I like your recipe because it is the other way around. More Coconut Oil and less Shea Butter. I will definitely be making this as some lovely Christmas gifts. How much does this recipe yield? Or how many mason jars does it fill up? If using mason jars what size mason jars are you using? I just made some but seems greasy. I put in citrus EO for scent and,still have coconut smell . has anyone actually made this and tried it? I tried this and followed directions. turned out great. but left it at room temp and it went back to completely oil. tried to whip it again but it wouldn’t fluff back up. any thoughts? does it have to stay in frig??? 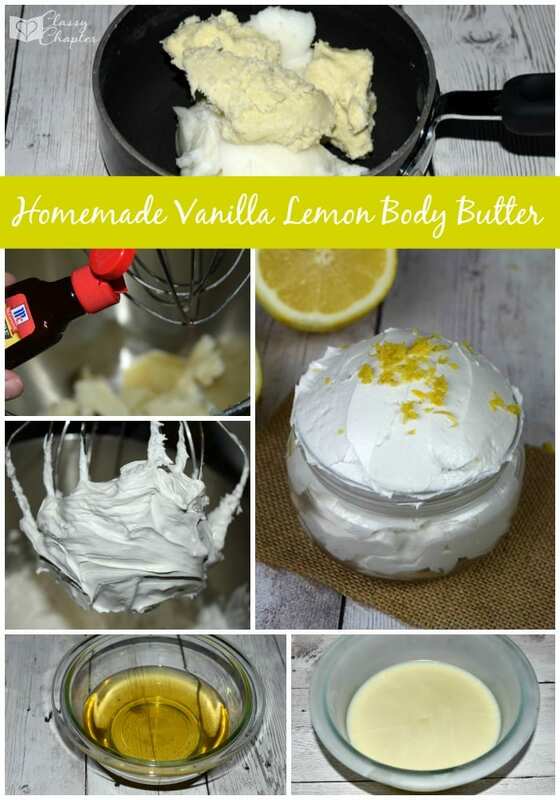 I just tried the body butter and loved how creamy it was especially compared to an other recipes I tried as well. I needed to leave it in the freezer longer then 10 min and I could not get the Lemon sent to come through. Is there something I can do different? I made another batch and I also had a problem getting the lemon scent. I ended up adding more the second time around. 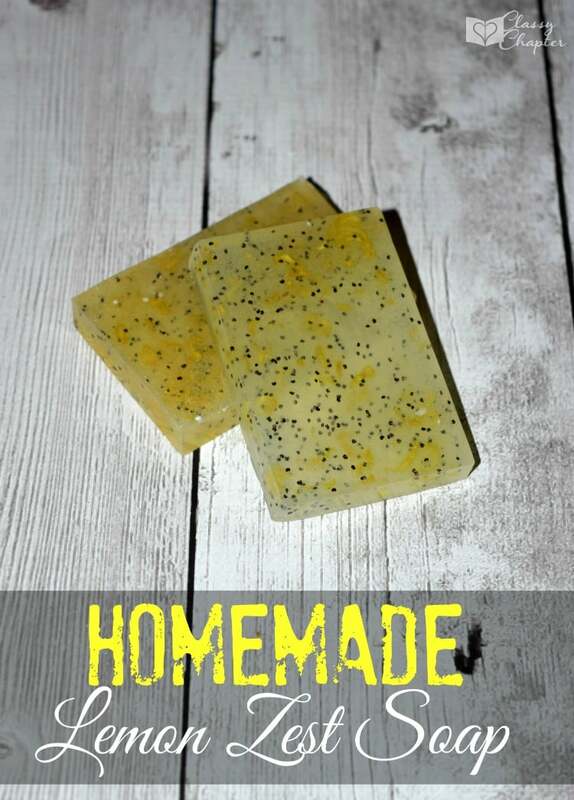 I halved the recipe and used the lemon extract but had to use so much more to catch any scent. Is it extract or essential oil? The Shea is overpowering any of the extract. Thank you. Do the extracts stay blended or do they separate out?